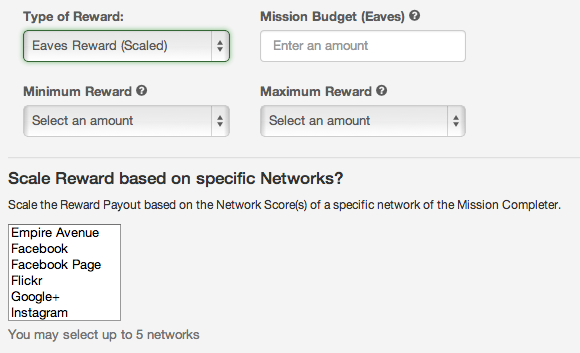 Have you wanted your Scaled Eaves and Vees Missions to scale the Reward based on a specific single or specific set of networks? We’ve rolled out the ability for Mission Creators to choose how they want their Mission Reward to be scaled when using Scaled Eaves or Scaled Vees Missions types. In effect, allowing the Mission to target those on Empire Avenue with a specific Social Network. This scaling is available to Mission Creators who have any type of Premium account. Gold and higher Premium Accounts can choose up to five Networks with which to scale. How this works: If you choose to scale by a specific network, then an individual’s specific Network Score is used to scale the Reward they receive. If the person does not have that social network connected on Empire Avenue then they will be rewarded the minimum possible regardless of the range you have chosen for the Mission. For example, if a Mission is scaled to Twitter with a range of 5,000e to 25,000 and the completer does not have a Twitter account connected on Empire Avenue, then they will see their reward as 500e. For a Vees Mission the minimum is 1V. If you do not choose specific network(s), then the Scaled Eaves and Vees Missions will function as before, using all of a Mission Completers Network Scores to contribute to how much the Reward will be.